Little WIMPs, is this your life? Three Weakly Interacting Massive Particles – WIMPs to physicists – may not sound like many, but they're enough for excitement. That's because if they exist, WIMPs would solve the “dark matter” puzzle. They are, however, exceedingly difficult to detect because of the first two words of their name. They're “weakly interacting”, so much so that if they do exist, you're under bombardment from WIMPs but never notice. The researchers claiming the three WIMPs are working at the Super Cryogenic Dark Matter Search (CDMS) in their underground facility at Minnesota's Soudan Mine. In a paper at Arxiv, the researchers believe say they have identified three events that might be WIMP interactions with their detectors. At this point, they're nowhere near the level of confidence that denotes a “discovery”. They're claiming a three-sigma level of confidence that what they've seen are WIMP signals rather than random fluctuations, but that only gets them to 99.81 percent certainty. 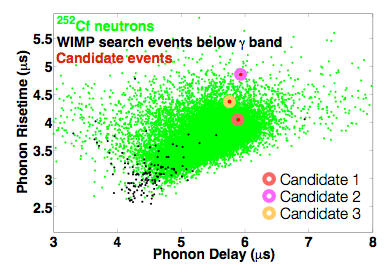 The detectors are trying to spot the “recoil” of atomic nuclei that have just encountered a passing WIMP. Their silicon instruments are cooled to 40 milli-Kelvin* to cut down on thermal noise. Since the detectors pick up plenty of other noise signals – Earth's background radiation, cosmic radiation and so on – it's still necessary to discriminate between these events and the signals they want. If they're right, however, there'll be plenty of work for physicists explaining a key detail of the “discovery”: these WIMPs seem lighter than has been predicted, at 8.6 GeV (giga-electron volts). * I stand corrected. Lesson: Google can't convert very low Farenheit temperatures to Kelvin.